It’s the end of February and cabin fever has you stir crazy, you can’t wait to get out and find some of that elusive gold, the 2012 gold season is almost upon us for some it is already here. 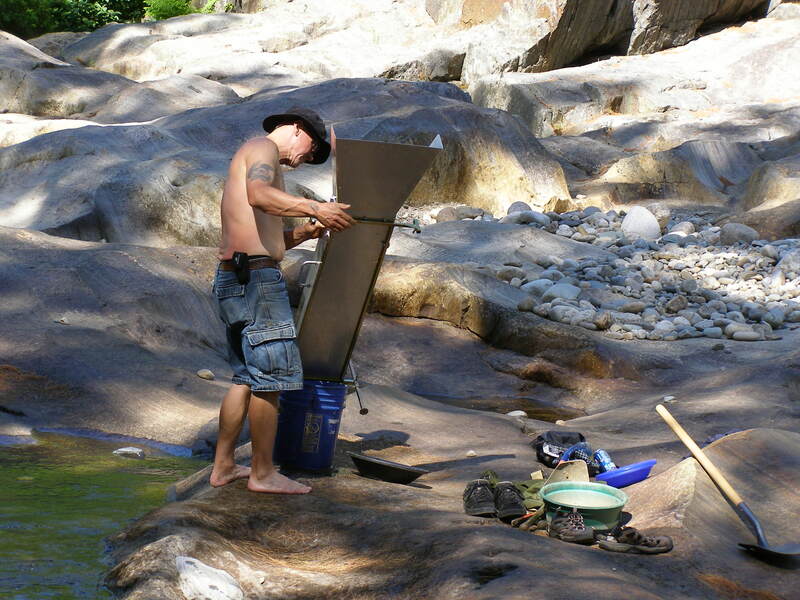 Now is the time to make preparations for your prospecting or small-scale mining adventures. It’s time to check your equipment and make sure it’s in good working order and make sure you have everything you need. I know for myself I need to pick up another crowbar I forgot mine in the river on our last dredging trip. Now is a good time to plan your prospecting adventure and this will determine your needs as far as equipment needed. Shovels: a long-handled spade is good, a folding military entrenching tool works great, you can fold it at 90 degrees and it also doubles as a pick, I love mine. You should also have a garden trowel. classifiers: a spaghetti strainer will work fine for test panning. Other wise you can buy various size classifiers that fit your 5 gallon bucket I find that these are a must for production. Crevicing tools to scratch out the cracks in ledge rock, these can produce some nice gold so don’t overlook them. You can make your own or you can buy them. Crowbar for prying rocks loose and breaking up that hard pack. Snuffer Bottle for the flour gold. You have found yourself a spot that contains a fair amount of gold already and you have decided that you would like to go into the production mode this would be more of a small-scale mining venture. A gold pan is just not practical for this type of venture, it is to time-consuming. Where you plan on setting up operation, how much you are willing to spend will determine what you should get. Many states require a permit to use these items and permit cost vary from state to state as do regulations. This is how I set up my sluice box, a Keene A 52. This will work for any sluice box.The recomended drop for the sluice box is 1 inch per foot, the Keene A52 is about 3 feet long so a 3 inch drop is good. Meaning that the feed end is 3 inches higher than the discharge end. I find that this varies to some degree depending on water flow. I don’t exceed 3 inches. The first thing I do is locate a good flow of water as near as possible to the location I am going to be working. You don’t want to be lugging buckets of material long distances this will cost you time and reduce production. There are times when you may have to channel water to your sluice box. You accomplish this using river rocks building a small dam fanning out in a Y shape from the feed end of your sluice box. This will channel water flow down through the sluice box. Place the sluice box in the flow of water. I try to get about half to three-quarters of an inch of water flowing through the sluice. Level the sluice box from side to side and I set my desired drop. I don’t get a ruler out but roughly 3 inches. I bought a stand for mine with adjustable legs this makes it easier but rocks work just fine. I check the flow by throwing a handful of rocks between a half-inch and an inch or so into the feed end of the sluice box. If the rocks blow right through then reduce the water flow. 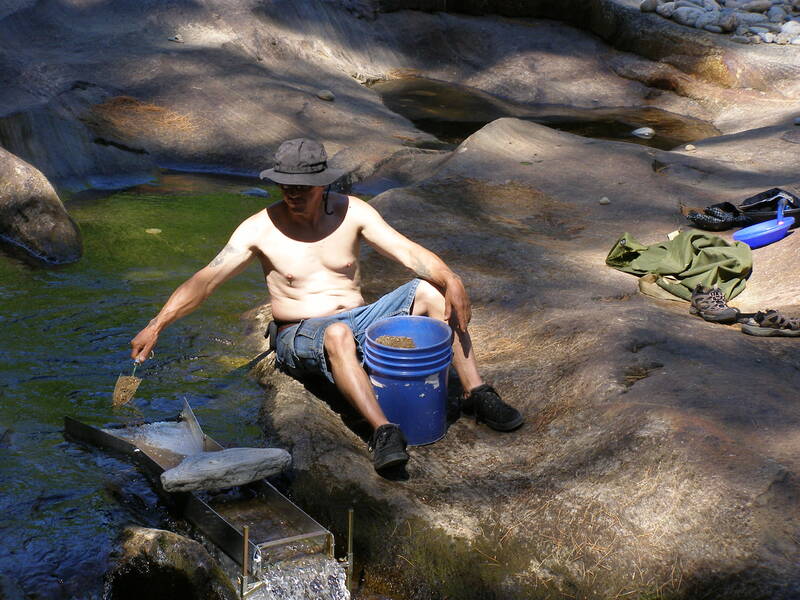 If the rocks stop in the sluice box then increase the water flow. The rocks should tumble smoothly through. Once I have this I place a large flat rock on top of the sluice box to hold it firmly in place. Next I shovel a scoop (garden trowel) of material into the sluice. I first classify the material I am working through a half-inch mesh screen (a classifier) into a bucket. I shovel this right into the flare and I am looking for it to move out of there in 5 to 10 seconds. I start processing a bucket watching that the material is flowing evenly through the sluice. I watch for material building up more one side than the other if this is so I level it from side to side until I have even flow. I make sure the riffles are not clogging up if this happens then increase water flow. The opposite is the riffles are washing clean then decrease water flow. You will see gold collecting in the rubber matting and it will stay there while all the lighter material washes away. 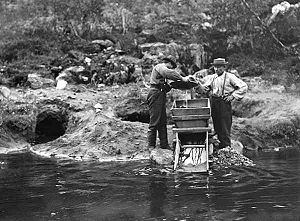 Clean up is easy just pick the sluice box straight up out of the water being careful not to tip your discharge end to low causing water to gush through this could wash some of your gold out. Put the discharge end into a 5 gallon bucket. 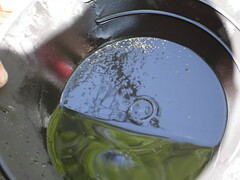 disconnect the riffles, take your gold pan with water in it and pour down through the sluice into the bucket. Remove the riffles, remove the expanded metal grating after rinsing it. Slide or roll the carpet or miners moss wich ever you have into the bucket, rinse sluice box thoroughly clean. Check the ribbed matting for gold and remove then set aside. Rinse out you carpet or miners moss then you are ready to process your concentrates. Notice the flow of water in this picture. Also notice the rock on top holding the sluice box in place. I had recovered some very fine gold. 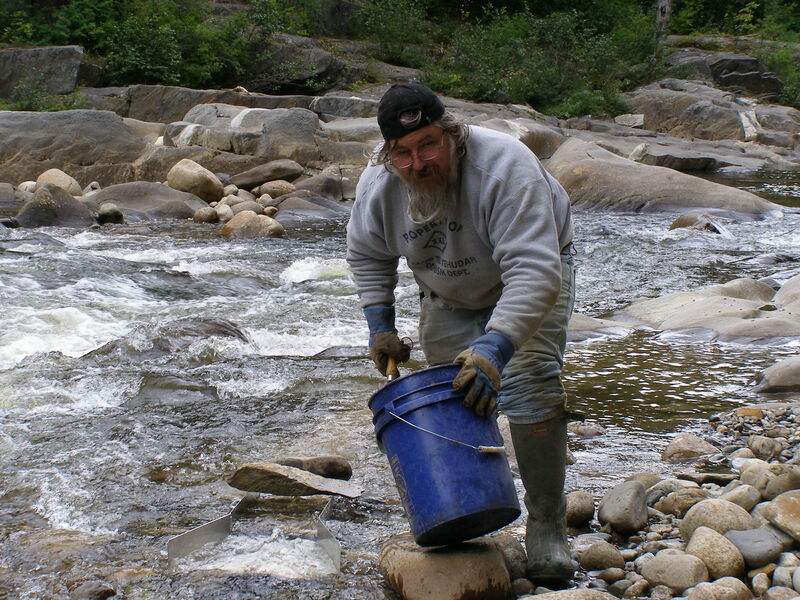 Notice the water flow here on the feed end this worked very well for us we had recovered some nice pickers and some very fine gold as well. Cleaning up the sluice box. You may have to tweak this process, experiment and have fun with it.